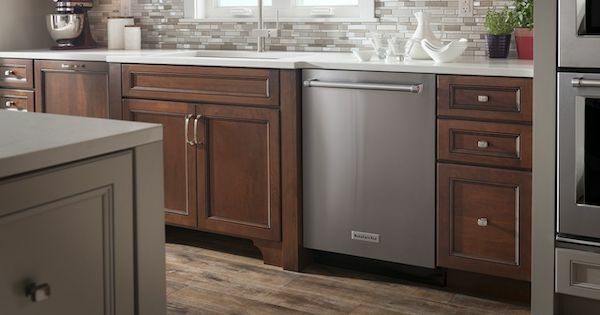 Before you head out the door to shop for a new dishwasher for your kitchen, one of the first things you should ask yourself is, "How much space do I have for installation?" This is especially important if you have an older home or custom kitchen that may have unusual dimensions. For more help buying a new dishwasher, check out our dishwasher buying guide! The rough opening size for a dishwasher, in a perfect world, is 24 inches wide, 24 inches deep and 34 inches high, but in older homes, this isn't always the case. With new models, typical dishwasher dimensions are 23.9'' wide, 24.5'' deep to the front of the door and 33.9'' high. Most brands make standard-size models, but there are some specialty sizes that are available to fit into spaces that are non-standard. For example, GE has a model that will fit smaller openings; the GE GLDT690JWW will fit an opening as low as 33.5 inches high. Fisher & Paykel drawer dishwashers will fit an opening that is only 23 inches deep. Many manufacturers, including Bosch, Frigidaire and GE, make compact dishwashers that are 18 inches wide to fit into small kitchens. Most dishwashers have leveling legs so they can be adjusted to sit flush under a countertop. However, having the standard opening will give you a lot more brands to choose from! Consider ADA compliant dishwashers if you have lower countertops, as they tend to be shorter (but not always). Make sure to measure the interior space of the cavity you have available for your new dishwasher - from the floor to the bottom of the counter, from the front of the cavity to the back, and side to side. If you're not sure what type of dishwasher would fit in your space, your knowledgeable local appliance salesperson should be able to help! That first point is especially important and is easy to overlook when doing renovations or exploring a new home! Even a change of 1/4 of an inch can result in a cavity that's too short for most dishwashers. You can make DIY gap fillers for the sides of the cavity by staining wood cut to the appropriate length to match the surrounding cabinetry. It should be pretty easy to determine what dishwasher size you need - space constraints more or less decide that for us! You may also want to look into dishwasher tub materials, the decibel levels, top vs front controls, and dishwasher rack types and materials. Or, just check out our free Dishwasher Buyer's Guide, linked below! 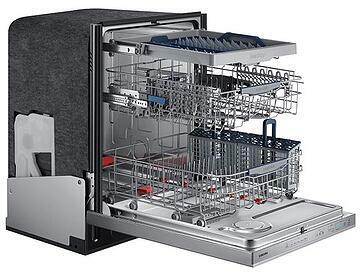 You can also explore our reviews of the best dishwashers of the year! Editor's Note: This blog was originally published in October of 2016 and has been completely revamped and updated for accuracy as of the publication date noted above.